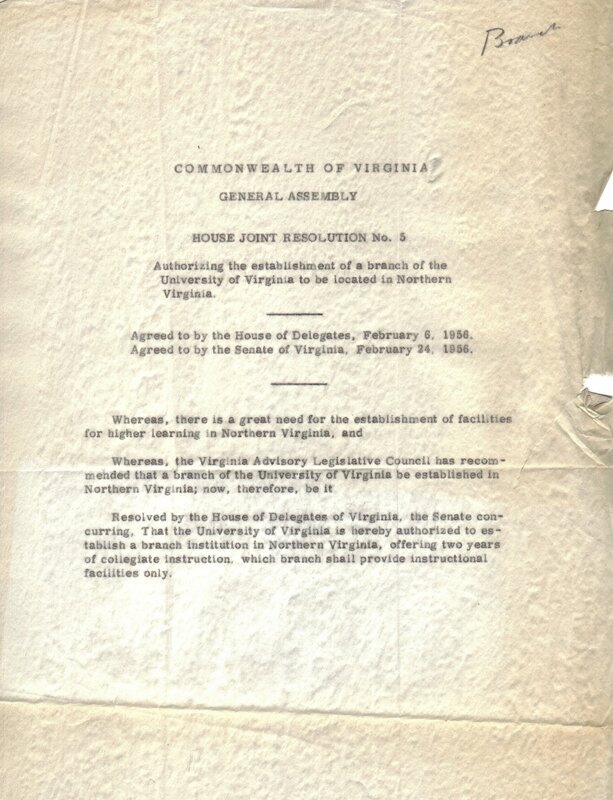 Given the favorable recommendations of the Virginia Advisory Legislative Council report of the previous year, representatives from the Northern Virginia Delegation to the General Assembly found the 1956 General Assembly Session an encouraging one before which to submit a resolution creating a Northern Virginia branch of the University of Virginia. In January 1956 Delegate C. Harrison Mann, Jr., brought House Joint Resolution 5 to the House floor for consideration. The resolution would establish a branch of the University of Virginia in the Northern Virginia area. The only fear Mann had was that some southern members of the General Assembly would see this bill as a first step in building a larger independent university in Northern Virginia. To help insure the passage of this bill and demonstrate to lawmakers that the University did not want to build an independent college in Northern Virginia, Mann added a clause that would limit the branch college to one “offering two years of collegiate instruction, which branch shall provide instructional facilities only.” With this small addition to the language of the bill it passed in the House quickly and with very little resistance on February 6, 1956. With Senator Fenwick’s endorsement, it was approved in the Senate on February 24. With the passage of Resolution 5 Northern Virginia had legal authority to build a permanent college. But before that could happen, a location would have to be selected. Browse other items relating to the year 1956. C. Harrison Mann, JR., Unpublished Manuscript, C. Harrison Mann, Jr. Papers, George Mason University Special Collections & Archives, Box 56, Folder 8, p. 37. Commonwealth of Virginia: House Joint Resolution #5, February 24, 1966, C. Harrison Mann, Jr. Papers, George Mason University Special Collections & Archives, Box 22, Folder 7.